If you are passionate about photography, then here is your chance to win exciting prizes worth $10,000 as camera equipments and also gain international exposure by participating in the Nikonians Photography Awards 2017. 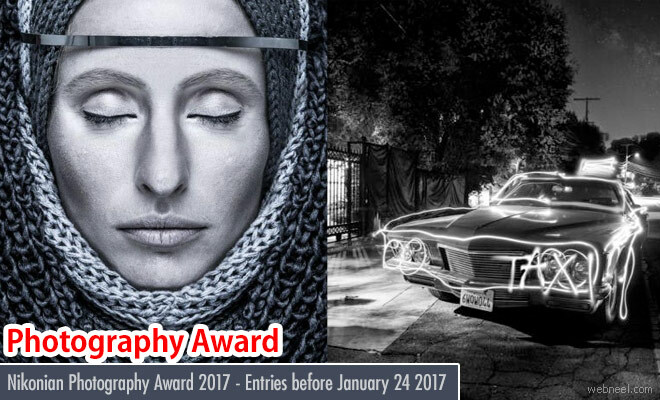 The deadline for submitting the photos is January 24 2017. According to Nikonian, "Winning photographers will receive vouchers to purchase the camera equipment of their choice from B&H Photo Video. Cameras, lenses, drones, tripods, flashes, lighting, filters, accessories & more are available from brands including Canon, Nikon, Fujifilm, Leica, Olympus, Sony & so many more. You can select whatever equipment you are looking for from the brand of your choice, or get the cash". You can submit your photos in the following categories: Wildlife, Landscape, Street, Travel, Black & White, Macro, Digital, People, Studio, Events, Panorama, Architecture, Family and many more. You can enter single images by paying a fee of $20 or submit 5 images for $50 and every additional image at $10. If you are planning to submit 5 images or more, you receive a free photography review from professionals. The contest is open to people all around the world who are aged 18+. "Nikonians has partnered with LensCulture to give you access to this organization who develops and fosters opportunities that help you move your photography career forward creatively and professionally. Through this partnership photographers can apply to be featured in an Online exhibition as well as gain access to many opportunities for exposure, recognition and learning through LensCulture" - according to Nikonian. Apart from this every participant will receive Professional Review by Photo Industry Expert and Opportunities for Immediate Exposure with Peers & Photo Lovers.